Aqua coming soon template is a beautifully designer and perfectly coded in HTML5 ready to upload HTML page template. 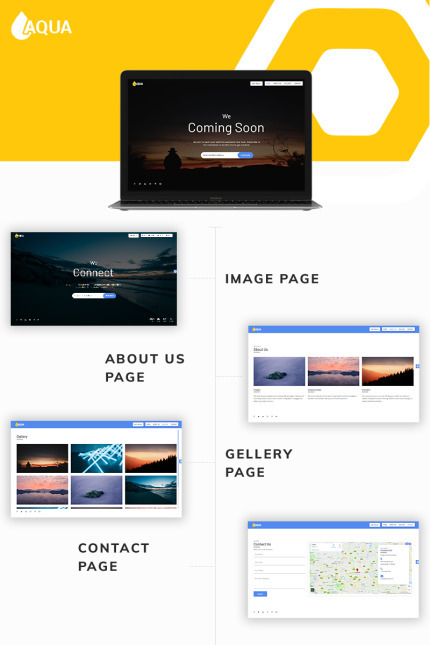 Here, you are getting 4 different layout style of the coming soon page. Each of these layout options has four different color patterns to choose from. You can easily customize the layout as well as the color of the template. It also contains additional information about the website like About, Gallery and Contact information. User can also subscribe to the website newsletter to get the latest updates. There is also a separate section to show case all-important social media profiles. What you need to do is just add the links to your social media profiles and it will be displayed on the coming soon page. It is a fully responsive template that looks absolutely perfect of each screen size and resolutions.